Since starting Network Spinal Analysis with Dr. Sophia Rodrigues, I am inspired to take better care of my body, mind and spirit. I am happier in my own skin, clearer in my intellect and emotions, and more aware of the depth of my spiritual being. It’s as though I am making a new commitment to evolving, to honor myself and my life, which allows me to honor all of life and recognize my unity. Network Spinal Analysis is vital for this time in human evolution. I had constant neck and sciatic pain that was stress related. I have less neck pain, sciatica is minimal, which I can often work out myself. I have a shorter recovery time and can do everything again, yard work, home repairs, and I am not pain ridden for weeks! Consistent treatments are the ticket to keeping you flexible and pain free. Having done traditional chiropractic, I find Network Care much more effective! I have scoliosis that causes back, hip and neck pain. 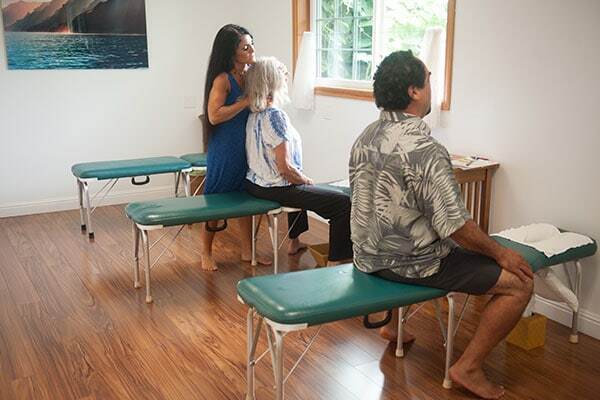 I was looking for an approach that involved a deeper level of healing for stress release, emotional balance, and healing my spine felt like a spiritual and emotional issue. I now feel energy flowing in areas I’ve never felt before, better sleep, more emotional balance, reduced stress, less pain, more energy, more transformation, and I feel more confident and capable to succeed in my life and relationship with my partner. I was in a head-on collision and had an extremely bad case of whiplash with excruciating neck and back pain. I am experiencing no pain of any kind. I think this is what you call a miracle!! I had lower back pain and scoliosis. My low back pain and scoliosis disappeared. I have more mobility, am more assertive, independent, have more energy and am happier. When I first came in, I had a sprained hip, was wearing a hip brace and could hardly walk. After the first treatment, I could walk again without pain. I was so amazed by the work that I continued and found that Network Care helped my body get through daily stresses, the stress of travel to the mainland and even the stress of my Mom passing away. I hardly ever get colds and flus or get sick anymore. I had compression fractures of T9 and T11 in my spine two years ago and had stiffness and loss of range of motion. My breath feels fuller, I feel taller, more flexible, empowered that I can change my spine without seeking outside help for my body. Dr. Sophia is sensitive and focused, and it is a real pleasure to be worked on with such intention. I have no aches and pains, very seldom a headache and no symptoms of carpel tunnel. I have good posture, and my overall mental and physical health has benefited. The quality of my life has improved. Stick with it—the results are amazing. The freedom from pain—totally—in my lower back is tremendous. I had neck and lower back and hip pain. The pain has subsided considerably to where I am more active with little to no pain. I love that I am now able to stay active and engaged in life since I always was a highly physical person. Dr. Sophia provides a loving and healing space. You can feel the ALOHA! I have only been seeing Dr. Sophia for less than two months and already feel way lighter in body, a lot less tension over all. I feel I have better posture and feel an increase in stamina, focus and peace of mind. I feel I am less overwhelmed by anxiety and fear since I have started treatment. Sophia is a Gem of a person and a pleasure to be treated by. I appreciate all the information she shares with me through the intake process and her ongoing classes held at the clinic. I am excited to continue with care to watch my wellness increase. I have also been telling many friends about Sophia and Network Chiropractic because I really believe in the effectiveness and importance of this work and I want to witness and share these transformations with others! I take my health seriously, and Network Care is part of my wellness. I am more flexible, strong, resilient, energized, confident and can perform my aerial dance better. I used to hurt my back a lot and I don’t anymore. When I feel things out of place, I can move to adjust myself! Disclaimer: Results may vary from person to person and are not guaranteed.